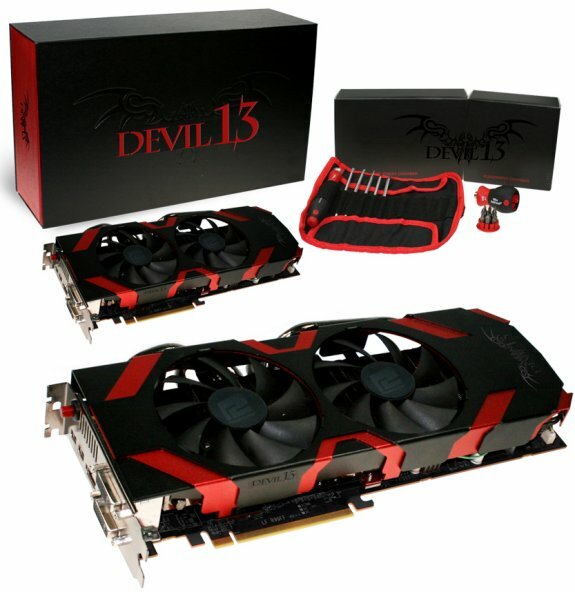 PowerColor debuts the Devil 13 Radeon HD 6970. This card offers the standard clockspeeds of 880MHz for the core and 1375MHz for the 2GB GDDR5 memory, but an overclocking switch takes the frequencies to 960MHz and 1425MHz, respectively. Special features include deluxe components, voltage monitor points, fancy LED indicators and a screwdriver tool kit. TUL Corporation, a leading manufacturer of AMD graphic cards, today reveals the ultimate edition of the HD6970: Devil 13 HD6970. Designed to fulfill the most demanding HD titles, the Devil 13 HD6970 has default clock settings at 880MHz core speed and 1375MHz memory speed. An OC switch means gamers can easily increase 10% frequencies to 960Mhz core and 1425Mhz memory, boosting up gaming performance to the next level. The Devil 13 HD6970 is built with solid components; including 12 phases design, direct FET, high current power beat and proadlizer, enhancing the power frequency and offering superb stability and reliability voltage for GPU with minimum conduction losses and lower temperatures at load. These components deliver the steadiest and most secure power to boost for gaming performance. The Devil 13 HD6970 includes voltage measurement points for gamers to measure and monitor the GPU voltage by multimeter. The Devil 13 is also pimped out with LED lighting signals that show the working status of current GPU, delivering a stylish experience while gaming. The Devil 13 HD6970 is equipped with two ultra large 92mm cooling fans, providing 60% better air flow than normal 80mm fan. With 4x 8 ø large heat pipes, heat is easily dissipated from the copper base which fully covers the GPU. With the optimization of the dual fan thermal design, the Devil 13 HD6970 can provide a quieter working environment with lower fan speed and deliver a better user experience. The Devil 13 HD6970 supports 2nd generation DirectX 11 technology and HD3D technology, providing intense gaming experience and unrivalled image quality with stunning 3D visual effects. The Devil 13 edition is also compatible with AMD’s Eyefinity technology, maximizing the field of view up to 4 displays, enabling a vivid gaming experience like never before.